All transactions are safe and secure with a reliable history in online purchasing behind each of our associates. 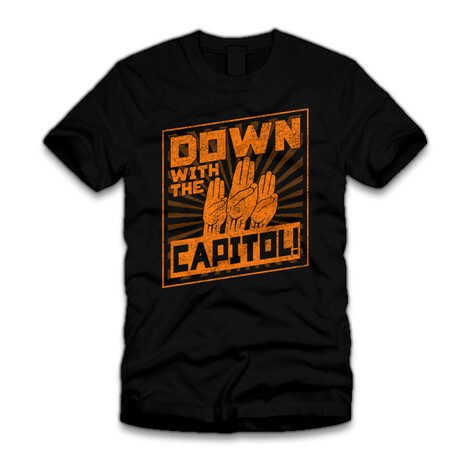 Buy the Hunger Games Down with the Capitol t-shirt to own Hunger Games clothing and merchandise. Fight with Katniss wearing one of these Down with the Capitol Hunger Games t-shirts that will inspire fellow rebels to stand up against President Snow. The Capitol is the largest city in Panem and is believed to be located in the Rocky Mountains. It's inhabitants are far better off than the citizens of the outlying districts, so much so that they often over-indulge in plastic surgery, dye their skin, and starve themselves to feel attractive. To them, the Hunger Games are a source of entertainment. In addition to the Hunger Games Down with the Capitol tee above, browse the Hunger Games Clothing Gallery for more apparel like men's and women's clothes, kids shirts or hoodies.